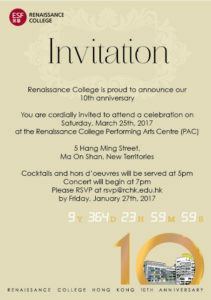 Renaissance College is proud to announce its 10th anniversary. A celebration will be held on 25 March at Renaissance College Performing Arts Centre. Please RSVP at rsvp@rchk.edu.hk by 27 Jan 2017.